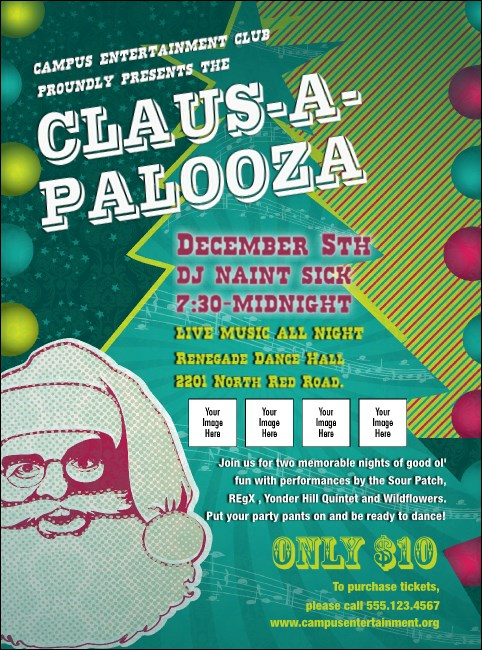 All eyes will be on your pre-event promotions when you use Claus-A-Palooza Flyers to advertise your holiday event in advance. Even Santa Claus would be impressed with these brightly colored Flyers that feature his jolly face in pink and an aquamarine Christmas tree with scores of music across the front. Upload four of your own images to the template for extra ad space! Roll into the holiday season with the right advertising from TicketPrinting.com.